Hinsdale Therapist: Margo Tirado - Therapist 60521. Send A Message To Margo. Margo Tirado is a Licensed Clinical Professional Counselor who received her MA in Clinical Psychology from Wheaton College. She has over 25 years of clinical experience in the field of psychology including community mental health, residential and milieu therapies. She is an adjunct professor at Huntington University and a sought-after speaker, having developed a series of workshops focusing on helping women cultivate their voices. She seeks to continually provide the most current and research–based therapies for her clients. 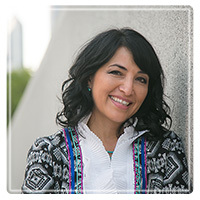 Margo Tirado just gave her first TEDx talk titled "How to Quiet A Shame-Producing Toxic Voice". Click this link to watch it. In 2010, Margo co-created The Dash Conference for women - an original one-day conference based on readings, research and clinical observations of the unique lifework challenges of women. These observations, paired with hands-on right and left brain experiences, created a unique one-day conference which moves women towards significant self-discovery, growth and life shifts. Whether she is teaching, counseling, coaching or blogging, Margo’s lifework is helping women find their voice, which is at the core of psychological health. Margo just celebrated 26 years of marriage to her best friend Frank, and she has raised two amazing adults, Francisco and Marisa. For fun and frills, she dances flamenco and is often found in her kitchen where she is known for serving friends and family ten-course meals when they come to dinner! Margo provides a monthly blog which empowers others to live a life filled with purpose, emotional health and confidence. Visit her website to read more to sigh-up for her next blog.